Loren Brichter created Tweetie, the incredible iPhone app that eventually became the official Twitter app. He invented pull-to-refresh. And if you had asked me what kind of app he might release as his long-awaited follow-up to Tweetie, boy, I never would have guessed. Now I know the answer, and I’m as pleased with the result as I am surprised by it: It’s Letterpress, a word game with a healthy serving of strategy to go along with it. 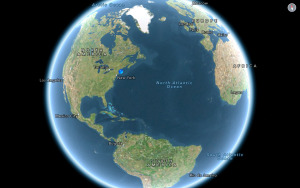 It works on the iPhone and the iPad, and it’s awesome. As you’d expect from a Brichter-built app, Letterpress is beautifully designed, with a sparse, minimalist appearance. It’s a two-player game; you can create games with random opponents, or play against your Game Center friends. You can use tiles of any color as you build out your word. Because the game’s approach is unique—sort of a clever mashup of Boggle and Strategery—it takes some time to explain (and master) the rules. Once you get them down, though, Letterpress is alarmingly addictive. At the start of a game, you’re presented with a five-by-five grid of assorted letters. On your turn, you can use any of the letters to build a word. The letter tiles needn’t be adjacent; you can tap from anywhere. After you submit your word, the tiles you used turn blue. Then it’s your opponent’s turn to make a word. The tiles he or she uses to spell a word turn pink. You can’t reuse words that have already been played. If you play “escapes,” your opponent can’t play “escape,” either; words that exist as prefixes of previously played words are rejected. When it’s your turn to build a word again, you can use tiles you’ve already turned blue, use unclaimed white tiles, or use the pink-colored tiles that your opponent played. As you play, then, some tiles will go from blue to pink to blue again, if you and your opponent keep spelling words with the same letters. 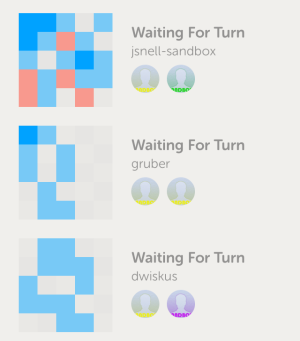 If the game ends with more of the tiles your color than your opponent's, you win! But there’s one important exception: If you box in a blue tile with other blue tiles—that is, if you completely surround a blue tile with other blue tiles—it turns a darker shade of blue. Even if your opponent spells a word using such a tile, its color won’t flip to pink. A key strategic element in Letterpress is thus attempting to box in your own tiles to lock their color, and simultaneously scheming to unblock your opponent’s tiles. Once all the tiles have been used (or after both players skip a turn), the game ends. Whichever player turned more tiles to his or her color emerges the victor. I tested the game for several weeks, and I frequently had numerous games going. Letterpress is fun and compelling enough that I needed to remind myself to put my iPhone down and, say, eat. Nice touches abound: the cute sounds that accompany each gameplay move, the bubbles that indicate what word your opponent just played, and—my personal favorite—the brilliant thumbnails that accompany each game in your game list: Each is a stripped-down white, pink, and blue square that indicates the current state of the board for that game. The clever thumbnails recreate the current game board in miniature. There’s room for improvement. I’d love the option to chat with my opponent; shunting trash-talk to a Messages back channel seems like an unnecessary extra step. And—though I recognize space becomes a serious constraint here—I’d love for Letterpress to provide some indication that I’m attempting to form an already-played word; in games that stretch on for several days, it’s easy to forget you’re building a word that’s already been played, and annoying to tap to the screen that lists all those past turns. Actually, you can only see that screen of past words at all if you pony up $1. Letterpress itself is free; a $1 in-app purchase unlocks that option, along with other color themes and the ability to play more than two games at once. You’ll want to spend that extra buck. My few quibbles are minor. The truth is, none of my suggestions would impact how fun Letterpress is, which is to say: very. Fans of word games won’t be disappointed. 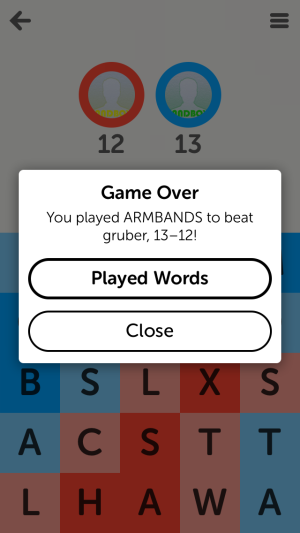 If you’re starting to tire of Words With Friends, or just want additional word-focused fun, Letterpress deserves your attention. Letterpress combines the fun of Boggle with Risk. 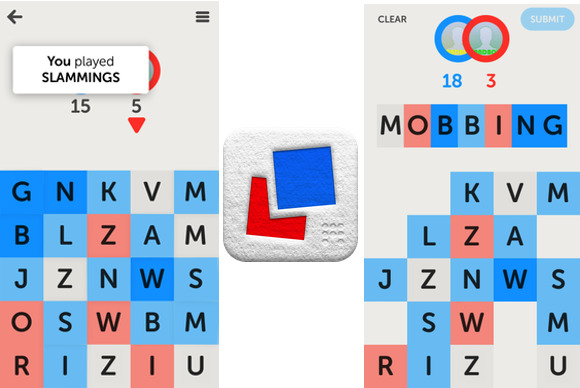 It's a great two-player app for word game fans.